24 Hours of Patch 4.3 « It's For My RP Spec! Void Storage: HOW Many Slots?! Void Storage is a feature I have been indirectly asking for since… uh. Since I started collecting things in WoW. While my preference is still a double-sized bank (hey, a girl can dream! 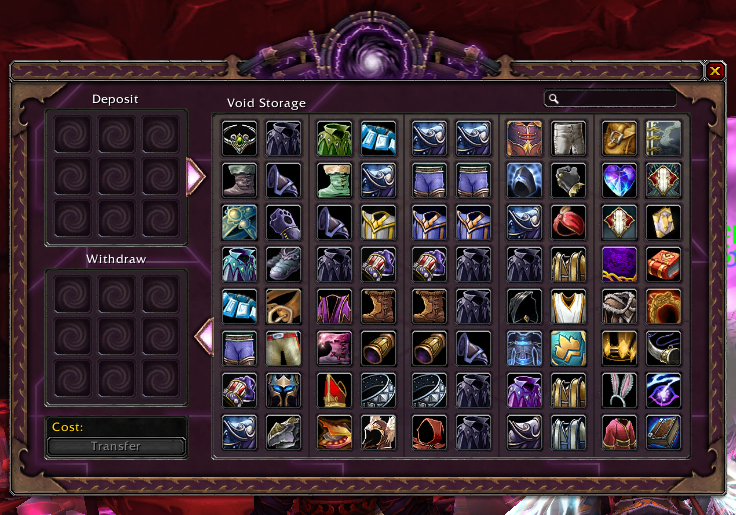 ), Void Storage will do for now. I am disappointed at how few slots there are. I filled mine up very easily and still have a bank that is literally full. Couple that with being unable to put half my holiday items into void storage and it’s sort of… lackluster. HOWEVER. I will not look a gift horse in the mouth and will be happy with 80 slots to store my sets. I mean, I have bag space for the first time in (literally) years. 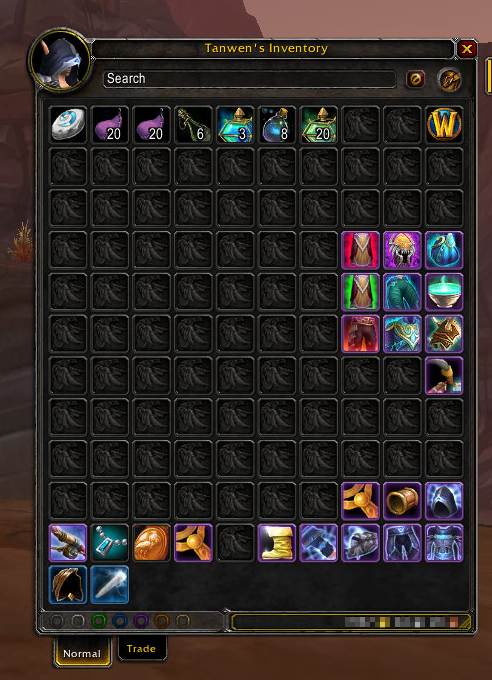 As an aside, I stopped by void storage Tuesday night after raid to drop off a few more things after agonizing over my previous deposits… only to see my entire void storage UI empty. After bringing the heart rate back to normal (“BUT YOU DON’T UNDERSTAND, there are literally irreplaceable items in there!”), I hit the forums and saw that it was a bug with several fixes. But that didn’t stop me from turning to the husband and saying I was going to be quite disappointed to have to turn around and cancel WoW, especially since I just committed to 12 months. But relogging fixed it! Hoboy. Pretty sure I need to be banned from ‘mogging more than once per day. 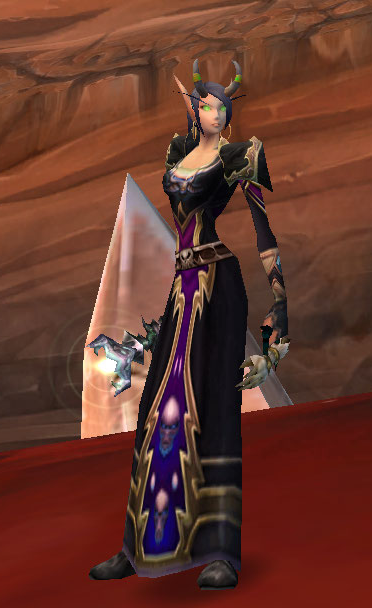 Tanwen has already worn Avatar, Absolution, my Whitemane costume, Absolution again, and now an outfit with the Necro-Knight’s Garb. It’s a good thing I don’t spend gold on anything else, because between void storage and ‘mogging, I’m going to be broke. I’m naturally very satisfied with transmogrification. It was definitely fun to see everyone’s favorite outfits in raid for more than just a kill screenshot. I was rather disappointed at being unable to use the bow Abriella uses in a lot of her RP sets. I imagine this is because it doesn’t have any “stats” on it, despite being green and having an Equip effect. But everything else I have tried to use has worked great. Now I just need to get a staff from Dragon Soul or something so I can use one of the 24379487 staves I have stored. Dragon Soul: Tuning and Facerolling and Gimmicks, OH MY. I’m going to have to admit that I don’t particularly care for Firelands. The fights are fine, I guess, but nothing really grabbed my attention. I know that I am in the minority on that but that’s the way it is. While the guild took a raiding break from March to October (totally not kidding here), Firelands WAS a nice warm-up for the pure, unadulterated awesome of Dragon Soul. Morchok was obviously a joke but I really love the stringy sparkly rock giant model, so I can look past the facerollability of the opening fight. Playing ping pong on Warlord Zon’ozz was a lot of fun, even though the energy ball occasionally liked to fly right through the boss. Finding out what ooze combinations our raid is… and is NOT… set up to handle on Yor’sahj the Unsleeping was an interesting twist. L2R’s video is right when they say it’s not really possible to make a straight up “how to” video, since literally every fight will be different. Going back to the Eye of Eternity for Hagara the Stormbinder was nice! I love the sky there, so while we all made jokes about how hard Blizz had worked on her encounter’s area, I was glad it was there. Her fight was a lot of fun and I liked being a lightning conduit! Ultraxion… oh man. That fight is pretty tightly tuned right now. This is where we had the most trouble, which is unfortunate since we only raid one night a week now. But the fight is FUN. I like the gimmick button and I like turning into Kalec! /swoon I can see his nerf coming already but I almost hope not, because it was a fun sort of stressful. Sadly, we had to call the night after Ultraxion (please see: one raid night a week) but it was cute to wake up in the morning to see GuildOx reporting us as number 1 on the server for 10 man progression (not the case but we’re close ;D). I have only done End Time and Well of Eternity but I’m just going to go out on a limb and say I like the Murazond fight the best. Murazond’s color palette is AWESOME, for one. Secondly, I love the clock sounds when the hourglass is used. Also, THE HOURGLASS. How fun is that mechanic?!?! Bloodlust. Oh look, Bloodlust again. Okay, another Bloodlust. I love it! I did have a friend complaining that they had some LFD groups who didn’t want to use the hourglass unless someone died. Um? Probably not the best use of that mechanic! Well of Eternity was a lot of… WAIT A SECOND, I’M A NIGHT ELF. Errr. Right. Tyrande’s voice actor is somewhat disappointing, while Illidan is awesome AS ALWAYS. 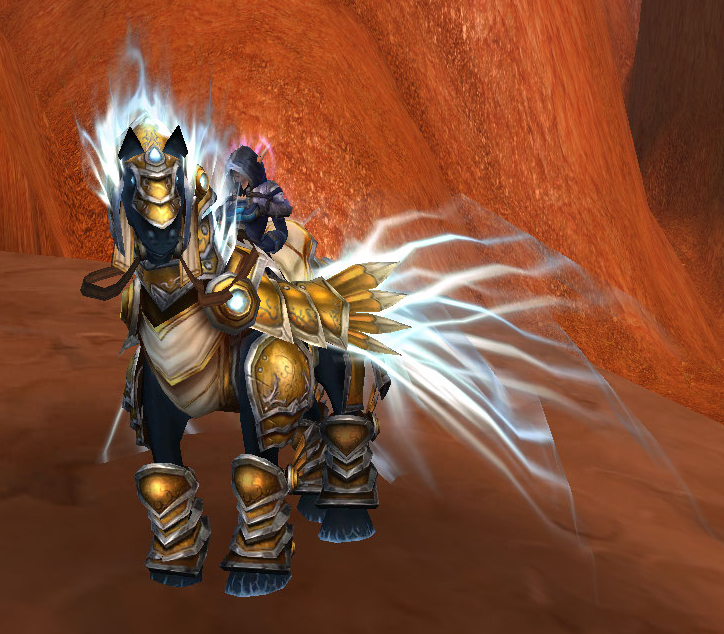 Speaking of time travel, don your tin foil hat and check out this article about Murazond on WoW Insider if you haven’t already. All in all, I’m very satisfied with 4.3. I’m looking forward to doing Hour of Twilight tomorrow and checking out the new Darkmoon Faire as soon as it comes up. How has patch 4.3 been for you? Oh, I am very jealous of your Necro-Knight’s Garb! Always been sad I can’t get my hands on it. It’s definitely one of my favorite pieces I’ve picked up along the way. Good thing the shoulder model was reused, though, because I’m not sure what else would have matched it.